HMD is also getting in the wireless headphones business today, unveiling not one, but two different cable-free audio products. That’s despite the fact the Nokia 7.1 still comes with a traditional 3.5 mm jack, mind you. Basically, instead of forcing you to pick up either the True Wireless earbuds or Pro Wireless earphones, Nokia Mobile is merely offering you a convenient alternative to the conventional, wired music-listening experience. 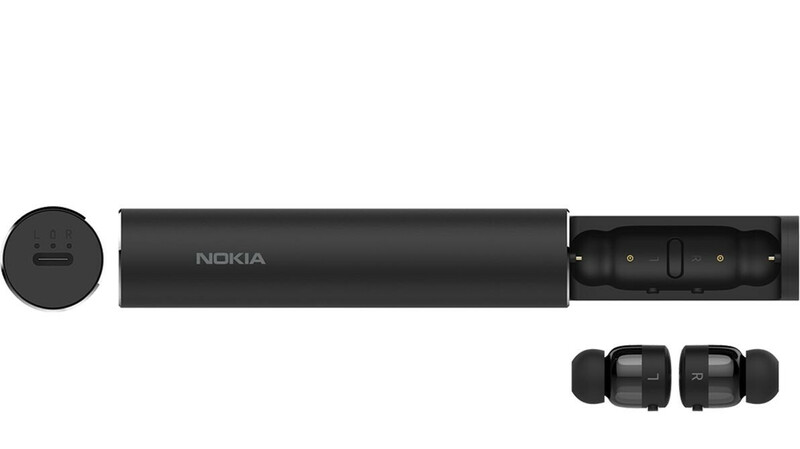 Because comparisons are inevitable, let’s start by pointing out the obvious - the Nokia True Wireless earbuds are black, so they’re technically not AirPods clones. Just kidding, their overall distinctive design and matching dark and handsome carrying case shaped like a tall cylinder should make sure no cloning accusations are filed. The tiny earbuds weigh in at only 5 grams each, promising a solid 3.5 hours of playback or 4 hours of talk time endurance between charges, numbers that can be easily boosted to 14 and 16 hours respectively with the help of the aforementioned case. That’s not quite as impressive as the over 24 hours of listening time boasted by the AirPods charging case, but the Nokia True Wireless have a couple of other things going for them, including sweat and splash resistance, as well as easy Universal Bluetooth 5.0 setup. The Pro Wireless earphones come with a 27.5 cm cord and 45 cm neckband, weighing a reasonable 45 grams and providing up to 10 hours of audio playback from a single charge, no heavy lifting needed. Resistant to sweat and splashes, these puppies are equipped with advanced Qualcomm aptX technology for HD sound, vibrating to alert you of incoming calls, as well as ending calls or pausing music if you remove the smart magnetic earbuds and clip them together. Pretty neat and affordable, huh? O no not another bullet type ear phones & wireless. Bad for blocking noise & always fall out of my ears. I think it's nice to see HMD branching out into making accessories for their Nokia branded smartphones. It's a good way to bring in extra revenue, and I hope to them do more in this regard. Thats why you always heard "PhoneArena"